I had another scan this morning to see how things are looking for our frozen embryo transfer next week. As I lay there in stirrups with a camera up my wotsit I noticed how my doctor always congratulates me on the smallest things.’Well done, your lining is looking VERY nice!‘….’look how quiet your ovaries are! Lovely!‘. It’s quite sweet. I think he encourages me to feel good about the small (ie, insignificant ) things so I don’t feel so bad about the overall failure of everything. He is a lovely man…..
…and I have a lovely (9mm) lining. So everything is looking good for next week. The embryo transfer is scheduled for next Wednesday. Providing our little embryo makes it through the defrosting process I should be back on the 2ww bus very soon. I guess I’ll do my pregnancy test around Saturday 16th as our frostie is a 6 day blastocyst. I’m excited and nervous all rolled into one – please let this be IT this time around. My period started this weekend so I went to the hospital this afternoon for my first scan. The downregulation has worked and my ovaries are nice and ‘quiet’, but guess what? The doctor counted 10 follicles. That’s the highest Antral Follicle Count I have EVER HAD. 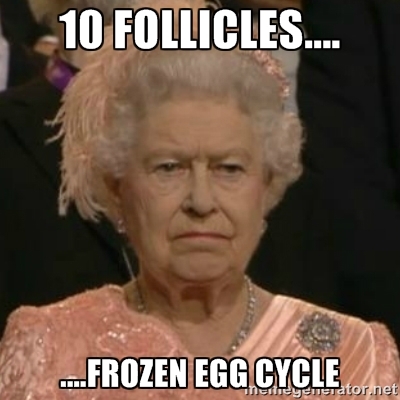 On this….. the only cycle where I’m NOT having egg collection. Insert your own ‘Isn’t it Ironic’ quote here.